'Quia Amore Langueo' continues the idea behind the 'Rappresentatione di Giuseppe e i suoi Fratelli' (PC10302) of composing new music in the historical musical language of the early Italian Baroque. In so doing, the aim is not to realise a perfect stylistic copy, but to create a new work of art by applying certain practices of Early Music and by approaching the zeitgeist of this epoch. While Giuseppe tells the biblical story of Joseph and his brethren in a manner similar to that of the first operas, this collection presents motets inspired by the more intimate and amorous madrigal genre, as well as two pieces in the dramatic style of the genere rappresentativo. 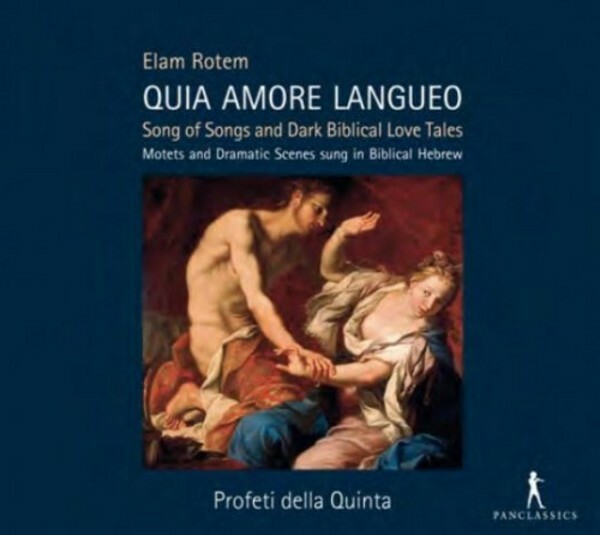 The motets set texts from the Song of Songs, while the dramatic scenes depict the dark love tales of Amnon & Tamar (Samuel II), and Samson & Delilah (Judges). The works of Claudio Monteverdi and his lesser known colleague Salomone Rossi, who worked side by side at the Gonzaga court in Mantua, have inspired specific aspects of the present collection. On this recording, too, the singer, harpsichordist and composer Elam Rotem and his Profeti della Quinta succeed in bringing strongly expressive 'new Early Music' to life. Through the use of historical musical language and genres, they bring listeners closer to the ancient yet ever relevant emotional power of biblical poetry.